Working in a kitchen can mean working in a highly pressurised environment. Food needs to be cooked and served quickly to meet to the demands of numerous customers at the same time, while continuously taking care to maintain the upmost quality. Then there is the need to always be mindful of safety with knives, numerous heat sources and liquids being ever present. To meet the demands of a busy kitchen head-on, organisation is essential; knowing where utensils are and where particular foods are stored will make all the difference when it comes to getting food served on time – and keeping stress levels down. The one attribute that underpins great organisation is tidiness. A messy kitchen is a recipe for chaos. If the right pan or the correct ingredient cannot be found at the right time, burnt dishes and frayed tempers could be the result. 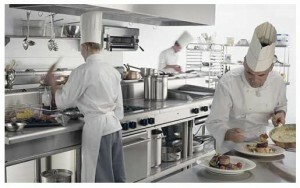 A well thought out storage system for commercial kitchens is a necessity. If every item used in the kitchen is kept in a designated place the chances of it going missing at that vital moment are hugely reduced. When designing a new kitchen making sure there is adequate storage to separate food, utensils, pans, towels and crockery makes sense. This will allow a tidy system to be put in place from day one and save from distracting busy chefs desperately searching for equipment in the heat of the kitchen. Take the same approach when choosing where to site equipment and try to keep the kitchen streamlined and easy to navigate to avoid unnecessary rushing around. If messiness and disorganisation have become issues in an established kitchen it could be the time to upgrade – or add – storage. There is no need to think this means a complete revamp. Adding additional storage or making changes to the kitchen layout could be easier than you think. Consider all aspects of the kitchen that could be better organised and tidier to leave catering staff free to focus on the task in hand and to ensure safety and quality are foremost in their thoughts. A tidy kitchen should not only be a safer place to work but also a calmer place. For advice on new or refurbished kitchen equipment please get in touch with the Caterline Commercial Kitchens Ltd team by calling us on 01384 459111 – get and keep a tidy kitchen.